Welcome to Late Night LiveLeak, your last chance at a WTF moment for the day. In tonight’s episode, an Iranian man takes his car to the shops. 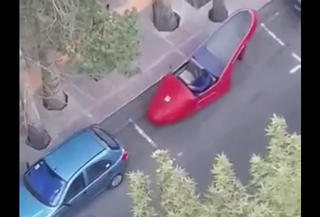 Except his car is designed like a high-heel shoe. We called it a boot in the lead, but whatever. I wonder if it’s Italian.. Play both at the same time. Just do it.